Do you think Detroit will become hip like Berlin? The subject was partially "hipness" which could describe a city anywhere and of any size. I don't think the OP was suggesting Detroit could "rival" Berlin. He was asking if it could rebuild utilizing a similar process, and I have shown that the process which the OP suggested is actually taking place, unbeknownst to most people. Because Detroit for so long relied upon a single industry, and has recently gotten a wakeup call, it is still questionable whether a total rebuild with diversification can succeed - though on a smaller scale than Berlin. I was there, and they are two different animals. Yeah, exactly. I don't think they would ever be really similar, but I could envision a similar type of rebirth between the two. People of my generation seem to like to take stuff and spin it new in some far-removed way. Detroit looks like a hidden playground for that kind of thing. Exactly, the last sentence. Then in the future I get to be líke "WHERE were you all when I believed in Detroit, huh?? HUH? HUUHHH?" You know, Jesse, this reminds me of a discussion I had on here some time ago where I was told that Canadians (I guess Ontarians, specifically) were more likely to come to Detroit's defense than even a Michiganian (or is that actually "Michigander"? ). It's kinda sad if that's true, no? I would think that the early stages of the city's recovery are going to ride on the back of whatever civic pride exists there. That might have been me, Montguy. 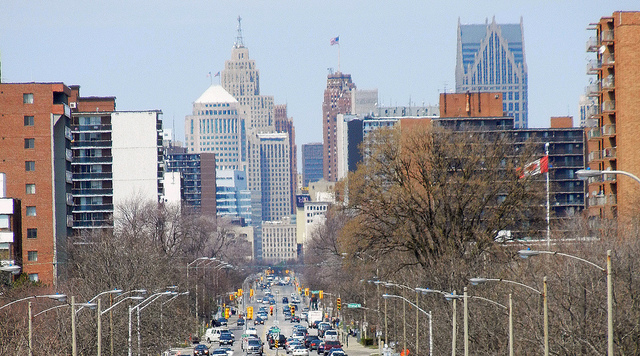 Windsorites in particular will jump to Detroit's defense before most living in even the Metro Detroit region. We've got a very, very long history with Detroit. Starting in 1701 actually. Families on either side of the border. Shared automotive success, and failure. We've watched her rise to the top, fall to the bottom, and burn to the ground. You can find me at pubs in downtown Detroit at least once a month. We here in Windsor are going to be lucky enough to have that front row seat in history. Last edited by Magnatomicflux; 03-08-2014 at 08:27 PM.. Ran across this as an example of the hipness of Detroit which probably parallels that of many major cities, but is not sufficiently newsworthy or controversial for the mainstream media to report. Plenty of Americans have zero interest in "hipness" and are happy to exist in relative cultural isolation, whether outstate Michigan or most places in the U.S. outside of cities. Notice the mention of Berlin here. Personally. I would love to see what's going on culturally in cities across the country other than the cliches which our "news" media deals in. Unfortunately, Detroit and mid-America is pretty much out of the loop except for certain subjects. Gawd, years ago on Detroit TV I remember seeing high school basketball from L.A. Though downtown Detroit did have some blight, this article incorrectly portrays it as blight and crime-ridden, which it never was, but stuff like this from outside has formed the national perceptions. For the record, when I lived in Detroit I had musician friends in Windsor, and I also worked at Grand Trunk Western, naturally staffed by Canadians who commuted across the river daily. I have fond memories of the Tunnel BBQ which was a quite-conveniently-located night time "oasis" for the munchies. I just discovered another Detroit "ambassador" which could have some impact. Visitors can be on the lookout for this in 2014. There is a special breed of tourist which seeks out filming locations. Last edited by detwahDJ; 03-08-2014 at 10:26 PM..
Uhm... you can't compare Detroit and Berlin. Berlin has never faced the same problems. Almost no population decline, and as an affordable capital city it is a much much bigger draw than a shrinking rust belt city. I highly doubt that Detroit is ever going to be in the same league. I do like Detroit and I hope it is going to turn around but it will never turn into another Berlin. Well Berlin had a bigger population in the 1920s and 1930s than today. I doubt that Berlin population would ever match it as it was many years ago and it suffered a major population decline due to war. Detroit never experienced that. Maybe in time Detroit would become hip like Berlin. To be perfectly honest, my assumption would've been that a Canadian city (and one in Ontario, no less) would be much more vocal in priding itself for having such a stark contrast with a city like Detroit in terms of its relative QOL before expressing any sort of sympathy or encouragement. Thanks for your perspective--I hope Detroiters appreciate it. Hell no. That would be like puffing up your chest and being smug because your once beautiful, successful, affluent sibling had a breakdown, and you didn't. We know what they've been thru, and have been thru most of it ourselves, right at their side. It's nothing to be boastful about. No problem, Montguy. I know alot of them do, at least from what I've read on message boards such as Detroityes! 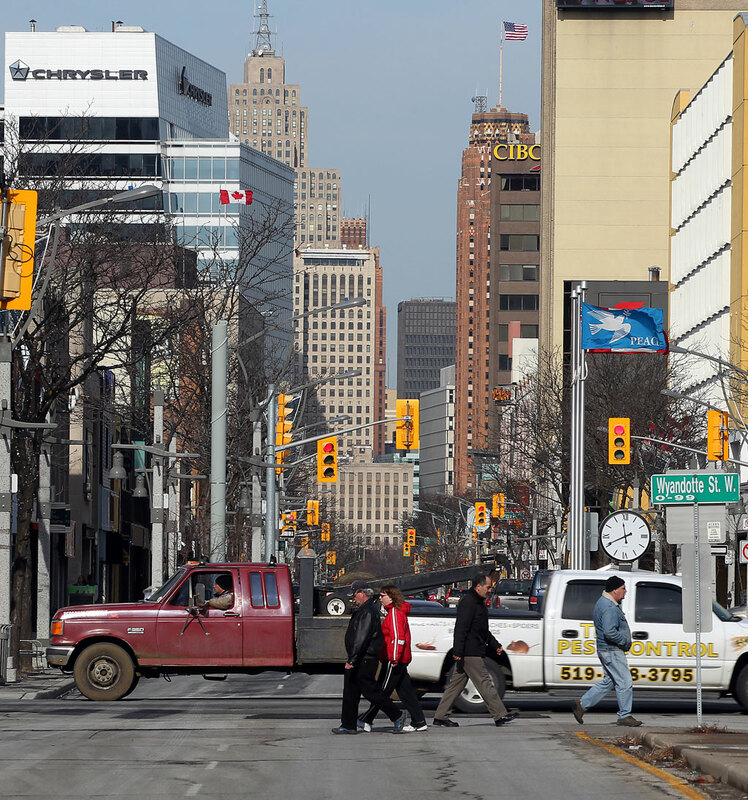 The relationship between Windsor and Detroit is an intimate one. It always has been, and always will be. In the early 1800's, when Detroit had it's great fire, Windsor sent it's entire fire department (for what it was worth at the time lol) to Detroit across a frozen Detroit River to help. When Windsor had it's great fire a few decades later, Detroit did their best to return the favour, but the ice on the river had huge gaps in it, and it took too long. Our downtown core had been gutted. During the race riots, Windsor Fire was in Detroit dousing blazes, all the while having the Michigan National Guard on top of their trucks protecting them from rioting snipers. When a riverfront hotel was buring here, Detroit sent it's fire boat to attack from the that side. Windsor's RCMP marine detachment is frequently aboard USCG ships patrolling in the river, and visa versa. Both being the automotive capitals of each country ment when WW2 hit, WE were the arsenult of democracy, not just Detroit. This region was absolutly booming. We thrived off it for decades. We think of ourselves as a two nation destination. An international metropolis, even. We hold an international freedom festival every year to celebrate Independence Day, and Canada Day, with a massive fireworks display held in the middle of the river. Last year, when Detroit claimed bankruptcy, the event couldn't be held for the first time in decades because Detroit couldn't afford to hire the police they needed to control the million people who descend on Heart Plaza. Windsor picked up the tab, no questions asked. There is so, so, so much more to it than what I've written, but I'd go on forever. When our Mayor travels the globe seeking investment, he ALWAYS makes a passionate plea to these same investors, to invest in Detroit! To give up on this notion that just because Detroit's municipal government is broke, so is her economy, her people, and everything she has to offer. Every time. Admitedly, what's good for Detroit, is good for Windsor. But we'll never turn our backs to that great city. A lot of post industrial cities have had to reinvent themselves, perhaps Detroit should look at some of the successes of other industrial cities rather than the National Capital of Germany, which is not really a fair comparison. In the UK Northern Industrial cities such as Manchester, Liverpool and Newcastle Upon Tyne have had to reinvent themselves in response to changing economic circumstances, and there are numerous other examples both in Europe and across the globe. Sure, gloating is exactly what an adult human being should do. Let's not indulge in encouragement. Instead, kick 'em while they're down and rub their noses in it while parading one's "superiority" before them, then shower them with pity and "good wishes" for the future - always a satisfying exercise. Fact is, things always change as they are doing now in Detroit and have done in other cities across the globe. Thing about Canadians - happily they are generally more civilized than to do what you suggest - qualities that most Detroiters have admired and appreciated, even to the point of calling them "more civilized" in many instances. There, I said it. Now, earlier the subject of gentrification came up. There has also been a good amount of anti-hipster rhetoric, but I see them as a possible benefit, especially if they start new businesses. They are not dumb, are usually creative, and IMO are possibly a wellspring of ideas whether or not one finds them pretentious. Did Berlin have these types? I was there for 1.5 years, but hipness was off my radar at the time. Last edited by detwahDJ; 03-09-2014 at 10:54 PM..